The Keystone Armory was established in 2010 by long time firearms enthusiasts and collectors. Our business is locally family and veteran owned and operated. Our team at The Keystone Armory is truly passionate about what we do. Since opening our doors we have worked hard to give our customers the best firearms purchasing experience in Northwestern Pennsylvania. We offer a clean, friendly, no pressure, non-intimidating environment for both beginners and experienced shooters and collectors to buy, sell and trade. 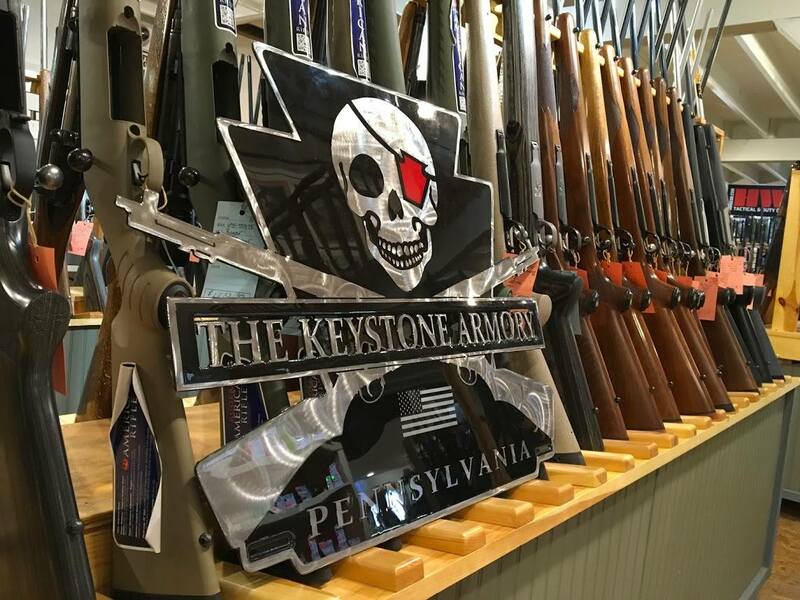 Located in Edinboro, PA The Keystone Armory provides Erie County and the surrounding areas the largest selection of top brands in the firearms industry. The Keystone Armory has become a favorite destination for many as we are your one stop shop for pistols, rifles, shotguns, ammunition, suppressors, holsters, slings, cleaning & reloading supplies, accessories, and much more! Need to complete an FFL transfer? A gift card for that special occasion? Class III items? Looking to sell a gun or even your entire collection? Our friendly and knowledgeable staff is here to help. Got a question for us? Contact us today or stop on in! Select from all of the top manufacturers in the firearms industry when you visit the Keystone Armory. You will also see a large stock in accessories for your firearms; including holsters, slings, ammunition, magazines, cases, safes, and much much more! In addition to our large stock of guns, ammo, and accessories, we buy and sell used firearms! The Keystone Armory also is a class III dealer with a large selection of suppressors. Not only does the Keystone Armory carry a large inventory of new and used firearms, ammunition, and accessories, but we also have a large collection of historical military memorabilia on display for our customers. The Keystone Armory is a great place not only to find your next gun, but also browse our array of rare military pieces from throughout the years in our museum like atmosphere. This veteran owned business, holds worth in the history or our country and its military. I just visited this shop for the first time. They have a great selection and all the employees were very helpful and nice. Awesome gun shop! Awesome people! Friendly, knowledgeable and attentive staff. Prices are fair or better (this includes ammo and guns). Quite a selection of rifles and handguns. Worth the visit!! The Keystone Armory carries the largest inventory of both new and used firearms, ammunition, and accessories in Northwestern Pennsylvania. We are also a Class III Dealer. We make it a priority to offer a clean and friendly environment for our customers to ask questions and learn from our professional staff. The Keystone Armory also offers the best prices for your used firearms. We are family and veteran owned and operated facility that wants to help you with your next firearm purchase or question! Give us a call at 814-734-2750, fill out our contact form, or stop into our shop during business hours. Visit the link below for a variety of guns that are up for auction. The stock changes frequently so keep checking back for new postings!